Fifteen young men and women recently learned they will spend four years training to become radiologists with the Emory University Department of Radiology and Imaging Services. The good news came on National Match Day, this year March 17th, the day graduating medical students across the U.S. and Canada found out where they would complete residency training. 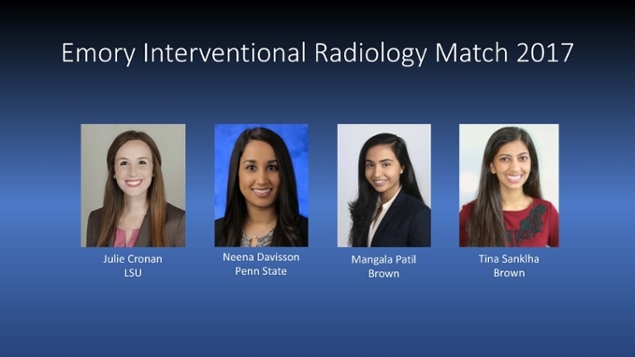 Eleven matched into the Diagnostic Radiology Residency and four matched with the new Interventional Radiology–Integrated Residency. This was the first Match process for the Interventional Radiology–Integrated Residency Program, which was approved May 2016 and opened for recruitment July 1. 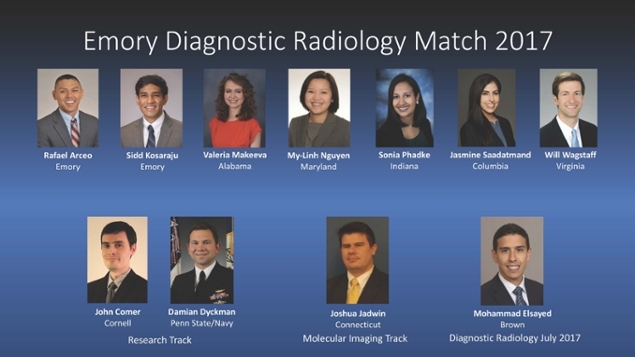 Dozens of Radiology faculty plus the chief residents were involved in the three-month process to identify top candidates for the two residency programs, which had separate match processes. Top candidates for each program were invited to Emory for an intense day-long vetting process. That process includes both formal interviews with faculty and informal gatherings where candidates get to know what life is like for residents from current residents. The department then sent its final rankings of the candidates for each program, and candidates sent their preferences to the National Resident Matching Program® (NRMP®). NRMP is a private, non-profit organization established in 1952 at the behest of medical students to provide a fair, organized mechanism for matching the preferences of more than 40,000 applicants with the preferences of residency program directors looking to fill about 30,000 residency positions. These new residents will arrive at Emory in June 2018 after they complete their required one-year internships.